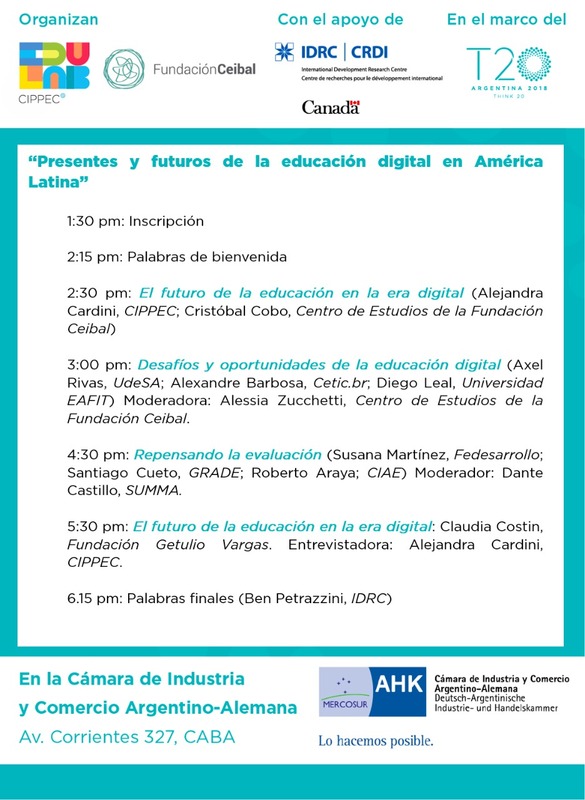 The Laboratory of Educational Innovation and Justice of CIPPEC (EduLab) and the Fundación Ceibal, with the support of the International Development Research Center (IDRC), are organizing the International conference “Present and future of digital education in Latin America”, a T20 Argentina associated event. It will be on August 29 at 13:30 in the facilities of the Argentine-German Chamber of Industry and Commerce, located on Av. Corrientes 327, CABA. Over 30 officials, researchers and digital education experts from Argentina, Brazil, Chile, Colombia, Costa Rica, Ecuador, Mexico, Peru, Uruguay and the United States will participate in the meeting. The objective is to discuss the challenges and opportunities that digital education offers in the region and promote its treatment as one of the central work topics of the Think20 in the framework of the Task Force “The future of work and education for the digital era”. The participants at the event include Claudia Costín (FGV, Brasil), Cristina Cárdenas (SEP, México), Paula Villalta (Directorate of Technological Resources in Education, Costa Rica), Dante Castillo (SUMMA, Chile); Santiago Cueto (GRADE, Peru), Susana Martínez (Fedesarrollo, Colombia), and others. If you are interested in participating, please complete this form. Entry to the event is free, but you need to register beforehand as places are limited. The event will also be transmitted through streaming.